closest vacation rental to the Cabana Club(membership included). bathrooms/showers, and lounge chairs, both poolside and on the beach. Beach. If you want to be close to the OCEAN, vacation with us. Our property is turn key and is one of the best locations on the Island since we are the closest full duplex to the Cabana Club Beach and Pool. We have a full duplex, which can sleep 6 per side and when rented together for multi family vacations can accommodate up to 12. See VRBO 449 for our other property. Our side by side full duplex is located just steps away from the Cabana Club beach and pool, making it one of the most sought after property's on the Island. Two units available. See VRBO 449. 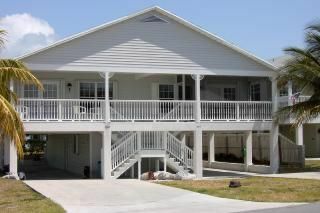 Each duplex has terrace with view of the Atlantic Ocean, only 200 feet away. Vacation rentals have 2 bedrooms, 2 bathrooms, fully equipped kitchen, cental air, dishwasher, washer/dryer, high speed wireless internet, cable TV's, Blue Ray Smart TV, gas grill, covered parking and much more. All linens provided. Experience counts and we have been renting our properties for 27 years! Deal directly with the owners. Steve's vacation home...is so much more than the pictures. What a wonderful 7 days....did not want to leave. and meeting lovely island folks. we had a nice spring break. our host was able to quickly solve minor problems we had initially. We loved the location and there are a lot of things to do nearby. Steve, the owner, was really good and prompt with communication. He check with us on day one to make sure everything was good. The pool was clean, large, never crowded and very nice. It is located just across the street and down one or two doors about 100 yards away. The only downfalls were the pool hours. It closes early, 5:00PM on Mondays and 7:00PM every other day. The pool also does not allow pool toys or inflatable inner tubes for the kids. They have strict rules that say no cannon balls. Our kids love both cannon balls and tossing dive toys and diving down after them. Unfortunately they were not aloud to. The pool is be better suited for adults, and older kids who want to relax more than play. That being said, our kids still had fun in the pool and the beach located just outside the pool. We rented the left side of this duplex for a week and loved every minute of it! Myself,my husband,my daughter and my friend had plenty of room to do our own thing. The place is not huge but it's 2 bedrooms,1 with twin beds, was just right for us.Very well supplied with towels,cooking utensils and gadgets. Has washer and dryer, right across the street from the Cabana Club and a big nice pool and the ocean and beach is right there also! Very close to shopping and Marathon is pretty much the midway point of the Keys, we took fishing trip on Capt Michael's boat from Robbie's on Islamorada for one day which was great. We caught enough for dinner that night and lunch the next day!! Yummy! Went to Key West one day and had a good time there too.All in all, we couldn't believe our week was up and we had to leave! Would recommend for anyone that wants a nice clean inexpensive place to stay in the Keys!! Very clean, very well kept, very comfortable. The home was well taken care of inside and out. Very clean and very comfortable. The location is right in the middle of everything. The Cabana club for pool access was a nice touch too the week off. One Warning do not eat at Havvan Jacks across the street until they have a real and perminate kitchen. Great place to relax for a drink just don’t get the food. Very nice, spacious unit. Good value for all that comes with the unit. We especially liked having a washer/dryer in the unit. Very comfortable king bed. All rooms were good-sized. We liked the relaxed “feel” it had. Nice central location in the middle Keys. Plenty of good, laid back restaurants in the area. The neighborhood was fairly active during the day, but quiet at night. Do it all or just relax!!! $300 SECURITY DEPOSIT REQUIRED AFTER BOOKING AND WILL BE RETURNED UPON COMPLETION Weekly $650-$1650 Dec 15 - April 30 $1175-$1350. Off season $950 Premium weeks $950 - $1650 ** Special Discount! $650/ Late Aug, Sept, $750 Oct-Nov, Early Dec excluding Thanksgiving Rentals are from Sat-Sat and include cabana club membership. Add Florida state and local 12.5 % taxes to above prices. Occupancy levels can not exceed 6 AT OCEANVIEW OR 4 AT CANAL FRONT Prices are for each 1/2 duplex - sleeps up to 6 12(if both rented) Dockage available Multi week and repeat customer discounts E mail owner for 12 page personal website Renting for our 26th year!